Demonstration of key clinical skills and communication strategies in mountain emergencies. Describe the dangers and challenges of the mountain environment and how to survive as a rescuer with limited resources. Demonstration of evidence-based management of altitude and environmental injuries. 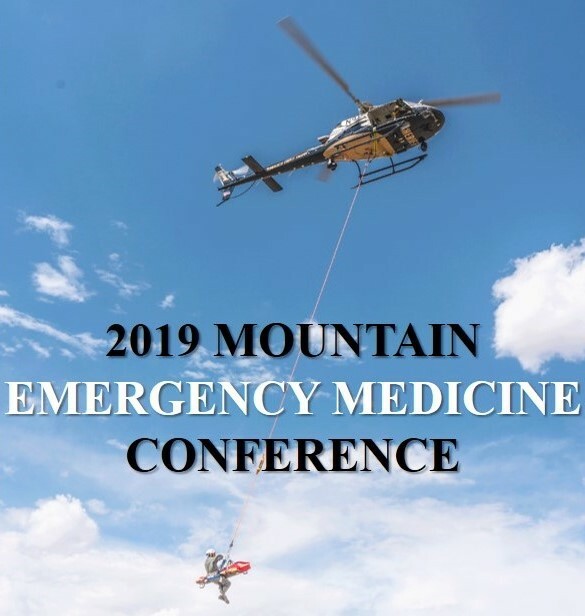 The integration of new technologies and medical tests into clinical practice related to mountain emergency medicine. Explain the importance of basic mountain rescue and improvisational medicine techniques. Registration includes conference materials and refreshment breaks on Thursday, Friday and Saturday (lunch is NOT included) and the reception during the Aprés Ski Presentation on Friday. Advance registration is encouraged. Register early to avoid disappointment. Due to limited enrollment, your registration will be confirmed. Please confirm your registration before making travel arrangements. Minimum and maximum registration numbers have been established for this conference. Registrations paid in cash must be in the exact amount of tuition. CME does not maintain a petty cash fund. It is UNM policy to charge offerer $35.00 plus normal merchant bank fees for each returned check. Make check payable to: UNM Continuing Medical Education & Professional Development and mail it along with registration form to: UNM CME, MSC09 5370, 1 University of New Mexico, Albuquerque, NM 87131-0001. To pay by credit card, visit the conference registration site. Your registration will be confirmed by email. UNM CME no longer accepts POs or faxed registrations with credit card information. If you preregister and cannot attend, Continuing Medical Education & Professional Development must receive written notification of your cancellation by March 1, 2019. A $40.00 processing fee will be deducted from refund requests received by this date. No refunds will be issued following March 1, 2019. Continuing Medical Education & Professional Development reserves the right to cancel this course twenty (20) days prior to the course date when a minimum enrollment is not met or for other reasons that prevent the University from holding the course. Each registrant will be notified by telephone followed by written notification and a full refund. The University of New Mexico is not responsible for any other costs incurred such as non-refundable airline tickets or hotel penalties. All eligible UNM Faculty and Staff may enroll using a UNM Tuition Remission (waiver) to cover tuition costs listed on the registration form. PLEASE DO NOT USE THE ONLINE REGISTRATION SITE. A copy of the UNM Tuition Remission Form, along with a copy of the conference registration form, need to be emailed to HSC-CMEWeb@salud.unm.edu or faxed to (505) 272-8604. The conference registration form can be found on the right side of this page (click “Download the Brochure”). Proper completion includes all required signatures. No refund or credit will be issued for non-attendance. Download the UNM Tuition Remission Form [PDF]. The University of New Mexico School of Medicine, Office of Continuing Medical Education is accredited by the Accreditation Council for Continuing Medical Education to provide continuing medical education for physicians. The Office of Continuing Medical Education designates this live activity (conference) for a maximum of 16.75 AMA PRA Category 1 Credit(s)™ and designates this live activity (Afternoon Workshop Options/Apres Ski Presentation) for a maximum of 4.5 AMA PRA Category 1 Credit(s)™. Physicians should claim only the credit commensurate with the extent of their participation in the activity. Continuing Education credit for EMT’s has been requested from the New Mexico EMS Bureau.